Falcon is a powerful Tag Auditing and Web Analytics Tool, which allows people with any form of online business to assess their website’s health and performance. It not only generates easy to understand reports but also points out what is and isn’t working for you. Be it a full scan or a custom scan, we have what you need. Today, we’re really excited to bring in yet another set of new features, which means that now your website is in even better hands! Pick out the appropriate category if non matched just select others. Define and Refine the regular expression or ‘Regex’ for the HTML code and the network calls. Validate against the appropriate source and save the tag. There you go! 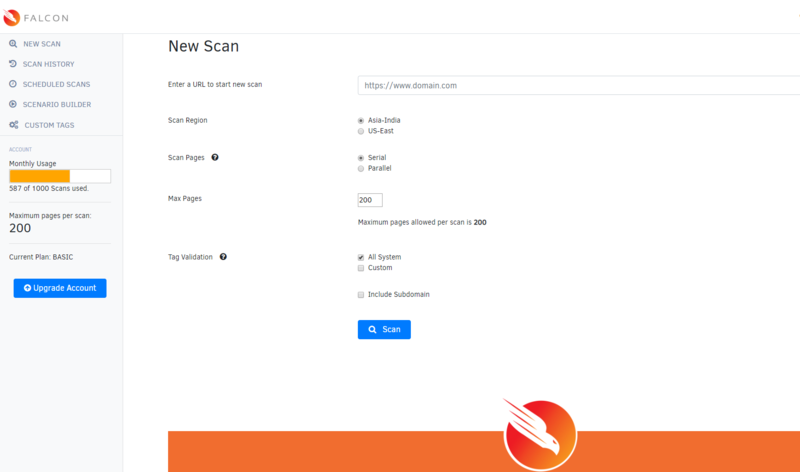 With various options to choose while submitting any new scan, you can now scan how-ever you want to! Choosing a crawl server from either India or USA, or specifying the sequence of each page scan from serial (one by one) to parallel (many page in parallel) during scanning. Include or exclude sub-domains, and lastly most important to carry out tag validations i.e choose tags to be validated for each scan from list of System and user defined Custom Tags. Finally choose to get the reports of each scan delivered to you! Spoil, for choice, aren’t we ? Now, you can choose to export reports in the PDF format for Scan results for each scan once Audit completes. You can either choose to look at the entire report, or look at specific aspects, ranging from tag auditing to web performance and even automated insights. There’s a lot more Falcon has in store for you, and you’re just one click away from a better you, online. Signup for free, to see the best you can get!